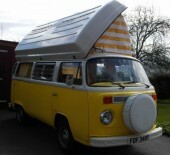 This page displays all the campervans that are available for hire in Monmouthshire . If you would like further information or to speak to the camper's owner about hiring their van please visit their Camperbug page, by clicking below. I am Vallerie, hire me today! Our Luxury Campervan Vallerie can carry 5 passengers ... and will sleep 4 ... or more if you would like to Hire our easy up Airbeam Awning too!